Gerber has been making survival knives for the US Military since 1968. The StrongArm Fixed Blade carries on their legacy of dependable, hard-working fixed blade knives for survival and combat applications. This knife features a plain cutting edge, full-tang 420HC steel blade with a black ceramic coating. The StrongArm Fixed Blade was designed around the fundamentals of military survival training. 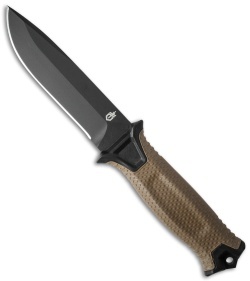 It utilizes a Coyote Brown rubberized diamond texture grip and adds a striking pommel and lanyard hole at the base. 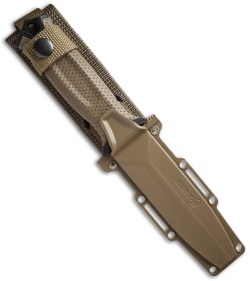 The StrongArm features a versatile modular sheath system. Snap together components allow users the option of vertical carry with the MOLLE, horizontal carry with a standard 1.75" tactical belt, or in a traditional drop leg mount. Very comfortable and the sheath is extremely versatile! Blade steel isn't the best, but it's easy to tune up when necessary. It's really good for 420HC. This is the only knife I take with me when I go camping, and I’ve never felt like I need anything else. It’s strong, sharp, and it carries awesome because of its well thought out sheath. Love this knife.